I’ve written before about cloth diapering newborns and infants, but since my last post on the topic was when the girls were 5 months old, now that they’re 18 months, I figured it was time for an update now that we are well into toddlerhood. Today, I’m sharing some reviews of brands/styles we’ve tried since I last wrote about our cloth diapering methods. 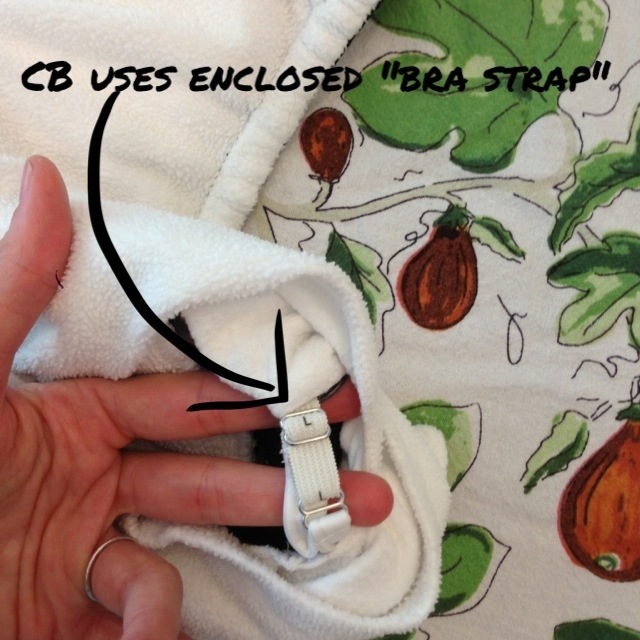 Tomorrow, check back for a post with tips about cloth diapering toddlers and cloth diapering at preschool or daycare. 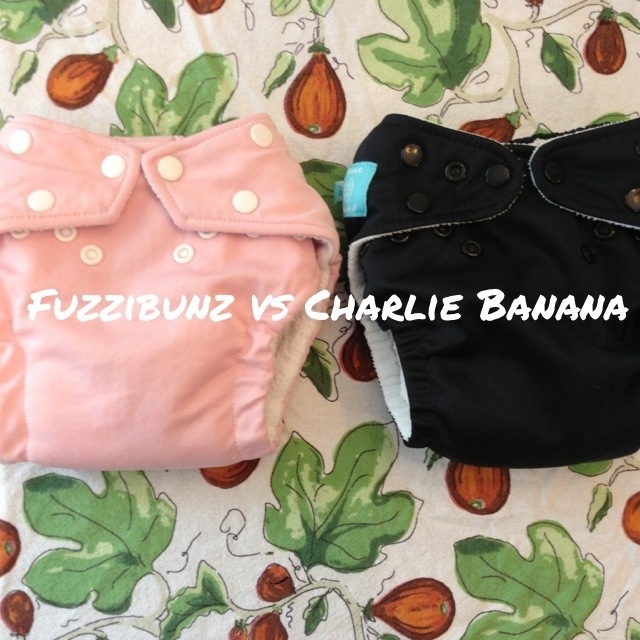 I picked up two Charlie Bananas OS cloth diapers at Target during a clearance sale, for $5 each. Regular price is around $20 per diaper. I’m definitely glad I picked these up. Structurally, they’re like a hybrid between my Alva Baby diapers and my BumGenius 4.0 snaps. They have snaps more similar to the Alva, with double snaps on the tabs and hip snaps to prevent wing sagging, but there’s a flap over the pocket like the 4.0s. They also stuff from the front rather than the back, which is different from most diapers, but doesn’t seem to affect the operation much. I will say, the inners are fleece where the 4.0s are suedecloth, and the fleece is much softer to the touch. Since some babies have sensitivities to suedecloth, these might be a better alternative for folks with that issue. They came with two microfiber inserts, one small and one large, and recommend using both for babies of 4 months or older. Since I usually just use one MF insert in my pockets during the daytime, I have only been using the large insert, and it’s been just as absorbent as my other MF inserts that I use on their own. I see no reason to use both unless you have a heavy wetter, or for overnights or naps. One thing that isn’t really an issue for me, but might be for some people is that instead of snapping to adjust the rise, the elastic is accessed on the inside and can be taken in or let out using a sliding buckle similar to a bra strap. 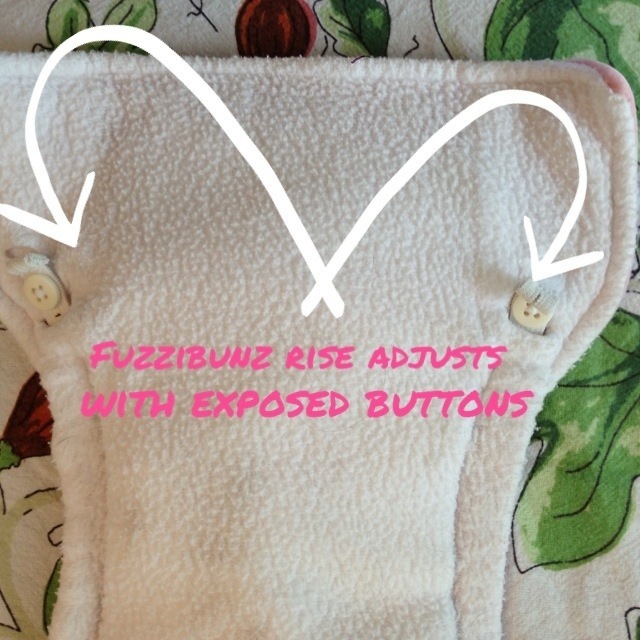 I hated (HATED) the elastic adjustment on FuzziBunz (which, I hate FuzziBunz diapers in general), largely because the buttons are exposed and dig into my babies’ skin, and would probably not enjoy trying to adjust Charlie Bananas up and down either, but since we’ve got the rise completely let out on all our OS diapers these days, I don’t have to deal with it at all. Overall, these are a nice pocket, just as absorbent as any others I’ve tried, and the fleece inside is nice and soft. I definitely recommend them. 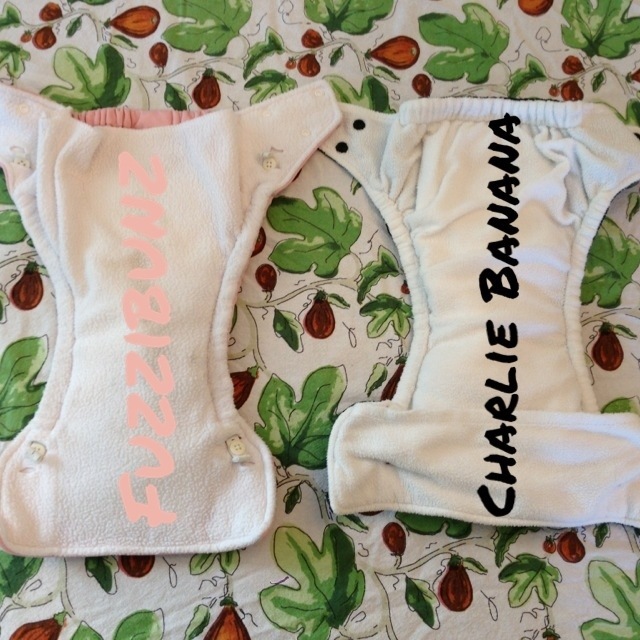 Here’s some photos comparing the Charlie Banana Pocket to some 2011 FuzziBunz One Size diapers. Another thing I’ve wanted to post about is how “Cheapy China” diapers from Alva Baby stack up to the more popular brands. 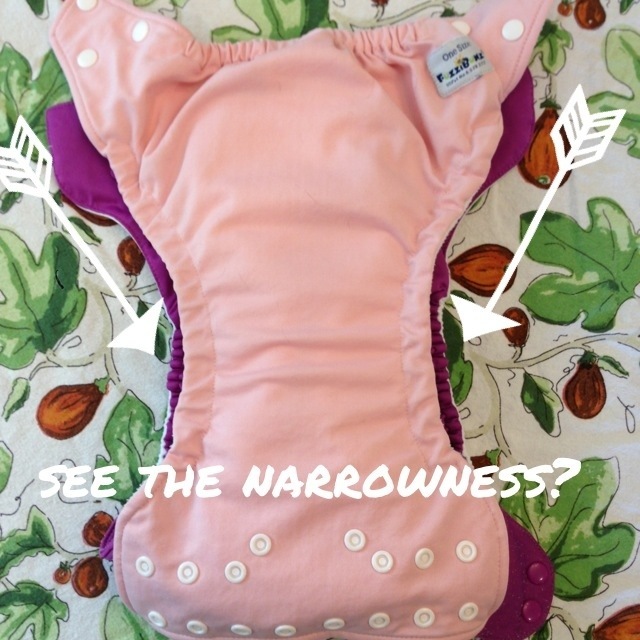 At less than $5 per diaper, Alvas are absolutely a great way to get a stash of pockets for very little investment. Sure, the website looks like it came straight from 1998, and free shipping from China seems sketchy, but they take PayPal, the shipping is slow but truly free, and they’re worth a try, whether you’re just filling out a stash, looking for a diaper to send to daycare, or buying all of your diapers. 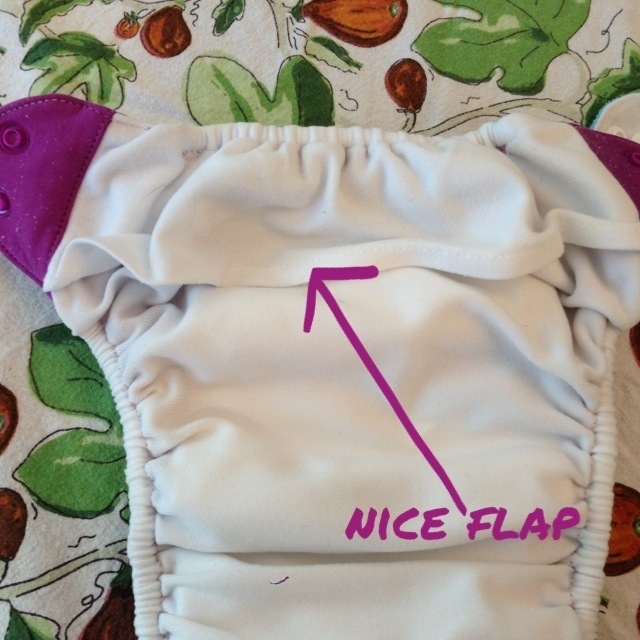 I will say, they seem lower-quality than BumGenius or Charlie Banana, with flimsier fabrics, snaps that don’t match the fabric, and no flap over the pocket, but they’re perfectly serviceable, and none of those features are dealbreakers when you’re talking 1/5-1/4 the price of the “name brand” diapers. They only come with one insert, but they’re not leakier than others, and I recommend buying a few of their bamboo inserts, because those are super absorbent. Another thing: they seem to run a little bigger, particularly in the legs, than the others. This is great news for Claire and her luscious thighs, but this might be a problem on a skinny baby (though Etta is in the 5th percentile, and they work fine for her). And despite the flimsier feel of the material, these have held up just fine for us, unlike my Fuzzibunz, two of which have lost snaps. Bottom line: Alvas are a great, cheap diaper and a great way to get the ease of pocket diapers on a budget. Recently, BumGenius introduced the Freetime, an all-in-one diaper that essentially marries their suedecloth-topped stay-dry Flip inserts with their 4.0s to create a stay-dry microfiber diaper with sewn in flaps that eliminate the need for stuffing. I bought two on sale, and I like them just fine. Pros: they’re a little trimmer than the pockets, and they’re a little more absorbent. You don’t have to stuff them, so they’re always ready to go. 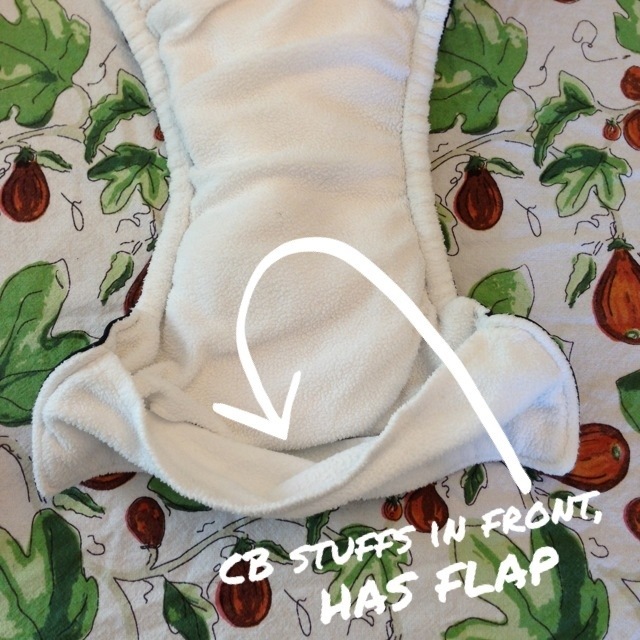 Cons: again, this is less of an issue for us because we just use the diaper as-is without having to size down in the rise, but having to fold the flaps over could be annoying. They’re also harder to get on right, because the two overlapping flaps try to slide out the sides, and because if you don’t get the flaps laid down right, baby can be lying on the flap, preventing you from pulling the front up all the way– so they’re just tricky. 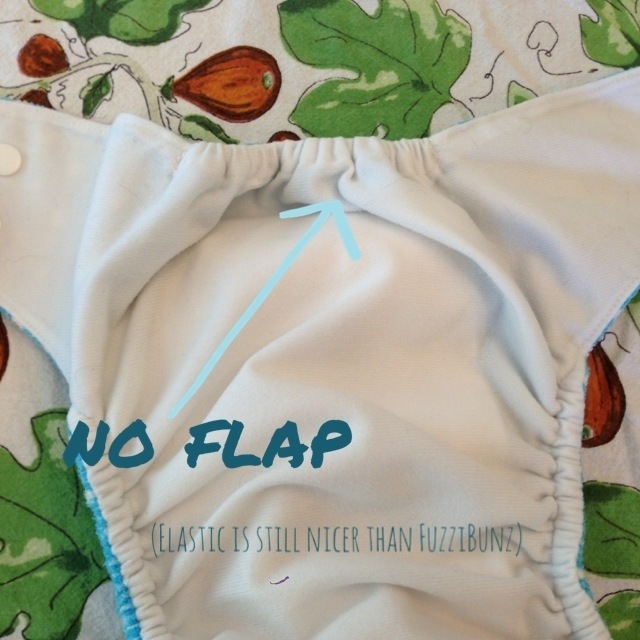 My husband expressly avoids using them, because he doesn’t want to fiddle with making sure the flaps aren’t peeking out the leg holes. Also, if kiddo poops in the diaper and you’re trying to spray it out into the toilet, the flaps flop around and have been known to make the process difficult. Overall: I like these diapers fine, and not stuffing is nice, but I still prefer the pocket style of the 4.0 because there are no flaps to fuss with, and because it’s easy to customize the absorbency with added inserts. First of all, if you have toddlers in warm weather, you MUST have a kiddie pool. Mine were a little young/unsteady as walkers to enjoy splash parks this summer, and we don’t have consistent access to a real pool, but the girls have LOVED their kiddie pool. Not sure why it took me so long to get one. Now, you can use an unstuffed pocket or just a diaper cover as a swim diaper, because all a swim diaper does is contain poop. Yep, even your disposable swim diapers which immediately become waterlogged when you get in the pool aren’t absorbing any pee. At first I was just using Flip covers, but those are kind of clingy, and I don’t think wet PUL clinging to my skin would be very comfy. Then, at the same Target clearance sale I mentioned above, I found Charlie Banana swim diaper/training pants on sale for $3.50. So nice. They look more like little swim bottoms, and have a cotton liner and a drawstring at the waist. Also, they pull double duty as waterproof training pants when potty training time arrives. I highly recommend them. I’m even thinking about starting to stock up on them to use as training pants when the time comes, because I like them better than any other trainers I’ve seen. The pink diapers on the right are the swim/trainers. Dude, if I ever have another babe, these posts are going to be INVALUABLE. When I was *attempting* to cloth-diaper four years ago, it was like a lost world. No resources, very little help on the interwebs… I was the lone pariah amongst my peers. I also completely agree with you about reusable swim diapers. I bought three adorable, printed Bummis swimmies from Amazon years ago and completely love them. I can’t even sell them at Rhea Lana because I still love them so much. Also, the swim diapers from Pampers and Huggies get so McNasty when wet, really, no better than a regular disposable diaper. So, in advance, thanks a million for all the info – you have NO idea how useful it is! Amara: It’s an amazing world these days! So much great info around, and so many options.